Adam Stebbins talks with residents at North Albany County Park Tuesday evening. North Albany County Park is going to look a little different after this fall. There will be fewer big old Douglas firs. 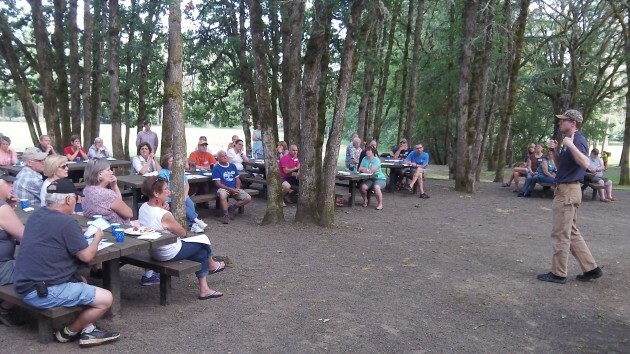 That was the main news I got from a community meeting at the park Tuesday night. About 50 people showed up, mostly to hear and talk about the 10-acre wooded area at Valley View and Crocker that Benton County has just been given by Myles Breadner, the developer of a nearby subdivision. The county plans to leave the wooded area pretty much the way it is except to build a circular waking trail inside it. A walking path will connect it with North Albany County Park to the southwest. The news about trees came from Adam Stebbins, Benton County’s natural resource coordinator. One hundred sixteen Douglas fir will have to be felled because they are dead or dying and are considered “hazard trees,” meaning they could eventually fall on somebody if left alone. Judging by a map he showed, about half the hazard trees are in the natural area and half in the park itself. They trees are doomed by a combination of things, according to Stebbins: Three years or drought followed by this past wet winter, poor soil drainage and city storm water runoff, insect pests, and fungal infections. Similar conditions are killing Douglas firs all over the valley floor. Trees logged off near but outside the donated area were cut as part of the subdivision being built there, and the county had nothing to do with it, parks director Jeff Powers clarified for the group. In the park itself, the loss of Douglas fir amounts to about 60 percent of all the park trees, Stebbins estimates. The cutting is to take place this summer and fall. There will be some replanting, but where and how soon is not yet clear. Some of it will depend on a new master plan for the park, on which the county is just now starting work. County officials are urging neighbors and others interested in the North Albany park to keep participating in the planning. To do so they can take an online survey or otherwise engage with the parks staff online or in person. The county’s website has a page on the North Albany park planning: https://www.co.benton.or.us/parks/page/north-albany-county-park-natural-area-master-plan-process. Why not log it and turn it into a “swale”? We can sell “Wetland Credits”. The City is paying Eugene $164,307 for wetlands credit to build the new police station. Why not pay yourself? The so-called “hazard trees” that are in the natural area should actually be referred to as “wildlife trees” and should be allowed to remain. Dead and dying trees actually play a vital role in the ecosystem, providing not only nesting cavities, but a rich food source for birds, since many insects are attracted to dead wood. It is even a required practice for private timber companies to create standing snags, because we now understand the importance of dead trees for wildlife. By calling them “hazard trees”, they are ignoring this fact and biasing others to accept their removal.